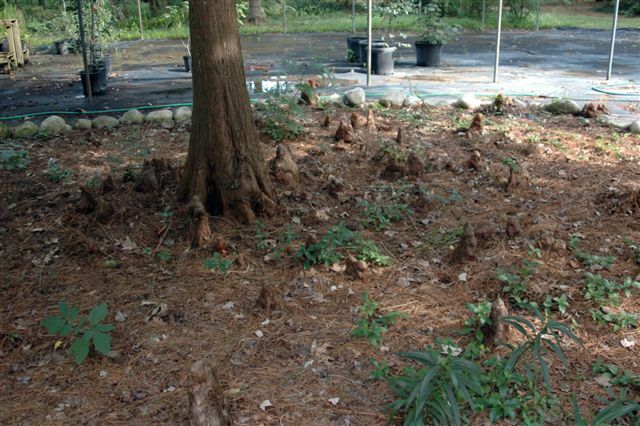 Specialized root structures of bald cypress that grow vertically above water or moist soil. It is thought that these structures aid the oxygen/carbon dioxide exchange in the roots. QUESTION: I have bald cypress trees in my yard. The root nodules are becoming a problem with my lawn mower. Would it damage the trees if I trimmed them off at ground level? B.D., Dallas. ANSWER: Yes, the knees are part of the root system. 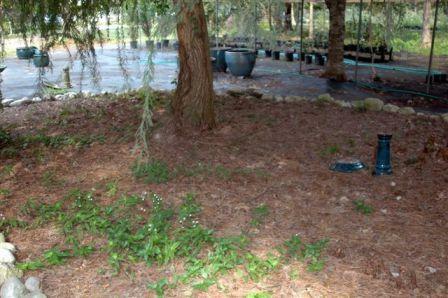 Change the area to mulch or ground cover and try to dry out the soil. The knees grow in overly moist soil. ANSWER: This is a characteristic of bald cypress. Their roots always do this to some degree, especially when the ground stays moist to wet. Improving the drainage and reducing your use of water will help, but the only way to eliminate the protruding roots is to remove the tree. I would suggest instead that you use mulch or plant a groundcover around the tree so you won't need to mow over or around cypress roots.